As the owner and founder of FSB Associates, I work with my team to seamlessly integrate social media and web publicity to develop campaigns that promote our clients’ expertise and books. Our content marketing strategies for authors are sustainable and scalable. We also create and design author websites to help authors build a foundation for their digital strategies. Bookgirl: What recent projects have you worked on that showcase the type of work you do? We’ve developed websites for the following authors: Dave Barry, Tom Clancy, Mary Higgins Clark, Sue Grafton and more. Bookgirl: What kind of authors and publishers do you like to work with? Fauzia: I love and value all the relationships I’ve made in the book industry. I never forget that it’s a privilege to work with so many talented people. I love working with authors who are passionate about their message and making a mark on the world. It’s such an honor for me to play a role in helping authors realize their dreams. We’ve worked on all types of books, and with authors at all stages of their careers and publishers large and small. I think it is important to collaborate with authors who are committed to building their brands online for the long term. Not all projects are right for us, and when a book is not a good fit, I am honest with the authors. There are no guarantees in publicity, but I try very hard to pick projects where I feel I can deliver excellent results. Bookgirl: What are some key things you’ve learned about the book writing, publishing and marketing processes over the years? Fauzia: Wow that’s a big question. I feel like I learn something new every day, but here are some important lessons. Digital branding is “the thing.” You have to invest time and money to develop it. If you don’t invest in your brand, no one else will either. Online publicity has never been more important due to the rise of competition for our attention with the mobile and social consumer. Today, sharing your expertise, your ideas and stories has never been easier, but building and keeping an audience has never been harder. Cultivating your brand is a slow build. Authors can’t create conversations overnight. To become a well-known and well-established brand you have to dig in for the long haul. Authors should prepare for a ramp-up period when they may feel like they are only writing for their moms. In terms of marketing and publicity, it’s better to take a few hours and write to one person at a time than to do a mass email. You will get better results. This is why I think press releases don’t work. Every author needs a digital marketing advisor or at least an experienced marketing advocate to protect their interests. This can be an agent, a marketing savvy friend or a digital marketing consultant, but the need is unquestionable and the development of your digital brand is essential for your book’s success. In our digitally connected world, authors can’t just put their books out there and leave themselves in the shadows. Today’s readers want a relationship with the author. This is why I advise authors to have a website and have it focus primarily on them (as the author) and secondly on their book. Social media is where you can connect with your readers, create community and build your audience and an author’s website is the foundation for a digital marketing strategy. There is no one-size fits all marketing plan for every author. Each author needs a customized digital marketing plan based on his or her specific niche. There is no everyone.com and authors shouldn’t try and promote their books to everyone. 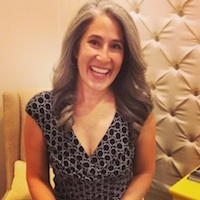 Authors who take time to identify who their audience is and figure out where they can connect with them online are often the most successful. On social media, engagement is more important than numbers. Bookgirl: What are some mistakes you see new authors commonly make? Not understanding their role as an author and a marketer. Not getting good help. You get what you pay for. Not having a website or having an unprofessional or poorly designed website is a big misstep in my book. Not collecting email addresses on their website and at events. Not partaking in social media which helps build a community of and for the fans. Having a smart social media plan is important. Don’t just tweet because someone told you to do so … first ask yourself if you think your audience is on Twitter. Being a bullhorn about their book instead of focusing on offering content of value and building authentic relationships. Going for numbers and likes on social media instead of creating community. Thinking everyone is their audience for their book instead of taking the time to determine the specific, ideal audience for their brand or niche. Once you know your audience, you know where to find them. Giving up on marketing too soon when every idea or piece of content doesn’t go viral. 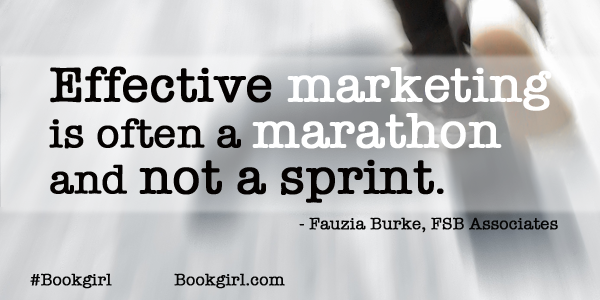 Effective marketing is often a marathon and not a sprint. However, the biggest mistake many of us make is not using all the data that is available to us to see what type of marketing works best for our readers. It is best to use Google Analytics, Facebook Insights, Twitter data and more to build plan that is effective and sustainable. We are all busy, so wasting time is not an option. Bookgirl: How are you typically hired for a book project? Fauzia: One of the proudest achievement of my career is that FSB has a 97% referral rate. We get referrals from previous clients—authors, publishers, and book agents. The other 3% come from referrals from my Huffington Post or Mind, Body, Green columns, and my speaking engagements at book industry conferences. Once a potential client reaches out to us, I contact them so we can discuss their goals and needs. If what we do, matches with what they need, then I ask to see the book to make sure I can deliver a successful campaign. We then move onto the proposal phase. 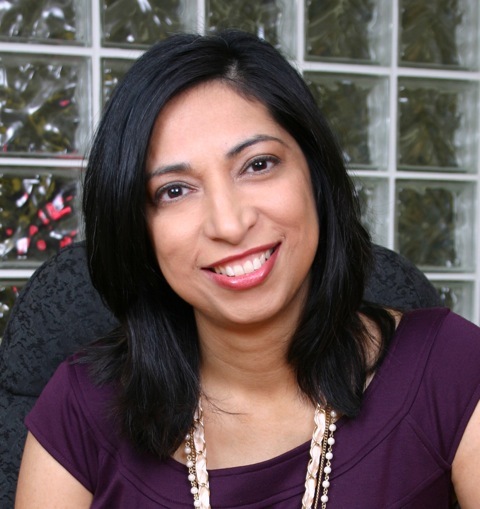 This entry was posted in Book Marketing and tagged book marketing, fauzia burke, fsb associates, PR. Bookmark the permalink.